An exciting new website for k12 teachers and administrators is about to go “live”. www.k12educationmatters.org is primarily a blog site with tons of extra content of interest to educators. The new site will feature video interviews with leading authorities and authors in the field of education. The site will also feature original content and links to just about anywhere an educator could care to go on the internet. There will be links to other blogs, newsletters, cool websites, professional association websites, publisher and author websites and much more. Contact publisher Greg Michaels for more information including advertising rates. “Teacher appreciation makes the world of education go around.” Helen Peters. Whether you are 8 or 18 years old, you live in South Korea or in Sweden, you are black or you are white. Everyone around the world has at least one teacher who has inspired them and motivated them to keep on going and never give up. The only thing we can give back is showing our appreciation for their work and effort. This appreciation makes teachers aware of what their efforts mean to us and keeps them doing the great things they do. Students from different country celebrate this in their own way, with their own and unique habits and on different dates. Today starts the week during which students of the US can express their gratefulness for what their teachers have taught them. Today starts the week where for once the teachers don’t give, but the students do. Today starts the week that entire classes work together to surprise their teachers. Today starts the week that makes teachers feel good about what they do. Today starts the week that makes the world of education go around. Today starts Teacher Appreciation Week. Until May 7th, teachers will walk out of their homes with an even bigger smile on their face than usual. Because they now that this is the week that they get recognition for all the effort they put into this job. “Teachers appreciate being appreciated, for teacher appreciation is their highest award.” – William Prince. They work so hard by teaching us how to write, read and count. They treat us as their own children and from today on, we can show them that we treat them as our second parents. Although we give them headaches and make them upset all the time, there is one week to make it all up and make sure that they don’t forget why they do so much for us. During this week and especially on Tuesday, everyone does their best to be as creative as possible and surprise their teachers with the most amazing and original ideas. On teacher appreciation info you can find a lot of initiatives that were done in the past and different tips. One tip is to keep in mind which teachers you are surprising. Try to know as much as possible about them and use this to create a present. In this way, your present means much more to those particular teachers and gets a personal touch. Your teachers are happy and so are you, because for once, you managed to give them something that means a lot and not the other way around. “Supply teachers who provide sickness support and cover emergencies at short notice are very much in demand, especially given the harsher winter conditions that we’ve experienced this year,” commented Stephen Heard, National Operations Director at Hays Education. He emphasised, “Supply teachers not only make a significant contribution to staffing needs, but they are also pivotal in ensuring that schools run smoothly and that standards are maintained in the education sector”. Supply teaching offers a great lifestyle choice and allows for greater flexibility, which suits people who have family or childcare commitments. Stephen continued, “Having the choice to work a limited number of days per week is a valuable option for some teachers, although they have to be flexible – in terms of both school and location – and available to travel at very little notice”. Working as a supply teacher also allows the individual to cement their experience by working in a number of different schools. An NQT starting out in supply teaching will develop valuable skills and a breadth of experience that they would not have otherwise gained in a permanent role. This gives them a chance to look at different schools and to establish the type of environment that suits their personalities best. Regular stints as a supply teacher can also serve as a valuable stepping-stone to a permanent teaching job. “It is important to foster relationships with the school as you will also be considered for a permanent job when one becomes available,” explained Stephen. “Fostering a relationship with a specialist recruiter that deals in supply teaching vacancies means that you can establish a career and become known among schools, which will subsequently ask for you by name as your reputation in the industry grows,”Stephen concluded. Hays Education is part of Hays plc, the leading global specialist recruitment group and specialises in a wide range of teaching jobs from cover supervision to head teacher jobs. It is market leader in the UK and Australia, and one of the market leaders in Continental Europe. On 30 June 2008, the Group employed 8,872 staff operating from 393 offices in 27 countries across 17 specialisms. npower, one of the UKs largest energy providers, has been hosting the ‘Climate Cops’ programme, which visited Worcester’s Powick C.E Primary School in an effort to help the school become greener and more sustainable. Over 52 pupils in years 4 and 5 were involved in the Climate Cops Academy which helps children learn how to become greener at home and in school in a fun and engaging way. The highly interactive day was filled with activities, including generating electricity with body movement, working with miniature examples of renewable energy sources and using thermal imaging cameras to see how much heat is emitted from human body and the effects of insulation. Worcestershire County Council has been working closely with npower for over 12 months on the Climate Cops programme, helping schools throughout the local area. The scheme follows the Government’s National Framework for Sustainable Schools and forms a key part of npower’s Brighter Futures Programme which aims to inspire young people from the first day of school to the first day of work and brings npower’s education programmes under one umbrella. The Climate Cops programme can also provide schools with ‘green makeovers’, including free energy audits, helping to implement tailor-made energy efficiency measures to reduce a school’s carbon footprint. This year, six other schools and over 375 children in Worcester will experience Climate Cop Academies, including; Cherry Orchard Primary, Turves Green Primary, Fairfield Community Primary, Upton upon Severn Primary and Great Witley Primary School. Lyppard Grange Primary School has already benefitted from the initiative at the start of the year. Teachers and children can go to the Climate Cops website at www.climatecops.com for interactive games and downloadable activities. Teachers can also visit www.npowerbrighterfutures.com to order their copy of the Climate Cops teaching resources that bring education for sustainable development, science, geography and citizenship to life. npower is one of the UKs largest electricity supplier and draws on 50 years experience in supplying electricity and gas. npower offers a range of essential home and business services to 6.6 million customers across the UK. Going the extra mile to assist Austin residents, military, police and other service personnel in self defense training and defensive tactics. ASD announces a 2 FOR 1 special for $99. ASD is known for its realistic and no nonsense approach to street survival and conditioning. Classes are offered and structured for persons of all athletic abilities, from ages 7 and up. Conditioning drills are incorporated to build speed, endurance, flexibility and cardiovascular system which results in a complete and well rounded athlete. Additionally, ASD concentrates on the mental conditioning and respect that builds discipline and focus. Austin Self Defense unique class structure and training methods allows for persons with little to no training as well as those with advanced backgrounds to train together yet advance on individual levels accordingly. Programs include: Haganah Adults, Haganah Kids, Krav Maga, Mixed Martial Arts (MMA) and Fitness Kick-Box Bag Classes. According to the National Center for Missing and Exploited Children report, 797,500 children are reported missing each year. In addition to the possibility of abduction, kids are continually faced with school yard bullies who can have a traumatic effect not only on the child’s education and motivation in their studies but also long term effects concerning personality and emotional trauma. ASD offers ‘Haganah Kid’s’, a mixed martial arts (MMA) program for preteens. The program comprises the best practical self defense techniques that suit child learners. Just as importantly, kids will learn life skills such as Respect, Courtesy, Self-Control, Perseverance, Confidence, Self-Esteem and much more. Emphasizing the importance of self defense and fitness training as a combined discipline, Dan Kiser, President of Austin Self Defense says, “Students will learn techniques relating to the defensive as well as offensive side of an engagement/attack. Just as important, students benefit from improved confidence, peace of mind, less stress, and increased energy and endurance,” he adds. ASD offers structured classes and private training with fully equipped modern self defense training amenities, certified instructors & unique conditioning with focus on creating self confidence and a balanced mental attitude for survival. 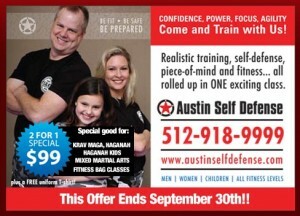 Austin Self Defense is a self defense and fitness training facility which was established in 2002. The Texas Self Defense company is known for its unique and precise approach in providing superior martial arts and conditioning. The programs are designed for all ages and physical capacities incorporating real life military survival skills and mindset to eliminate the danger quickly and without hesitation.